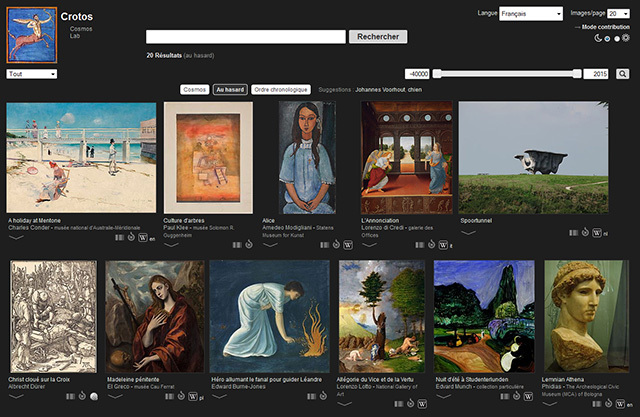 Crotos is a search and display engine for visual artworks based on Wikidata and using Wikimedia Commons files. Searches can be made by free or indexed search. Results are displayed by chrological order with thumbnails. Links on thumbnails open a viewer with the image hosted on Wikimedia Commons. It is possible to filter the results by type (painting, sculpture, print…) or to specify a period as criterion. By default, without criterion, a random selection is displayed. Besides with the Cosmos it is possible to discover the artworks by indexation (par type d’œuvre, creator, movement, genre, collection…). Under each result image are mentionned the title, the creator(s) (property p170) and the collection (property p195) or the location (property p276) when these information are on Wikidata. Indexed informations have links to start a new search. The interface is in 34 languages. The information are displayed by default in the language of the interface. In the absence of label in the language indicated, the information is displayed in another language. All data used in Crotos come from Wikidata, free database, collaborative and multilingual. Data are published on Wikidata manually or via robots, (like this one to migrate data from DBpedia as explained here: Voyage de DBpedia en Wikidata à bord d’un bot [in French]), or by creating new items via robots [in French], or via semi-automated publishing tools like Autolist or Quick Statements. The project has a contribution mode, useful for identifying missing information with facets. For example, artworks without English title. So if the envy takes you, do not hesitate to indulge yourselves. Finally, source is on github and the database of Crotos can be downloaded ; both are under Free Licence. Do not hesitate to make remarks, criticisms or suggestions to benoit (a) zone47.com or elsewhere.